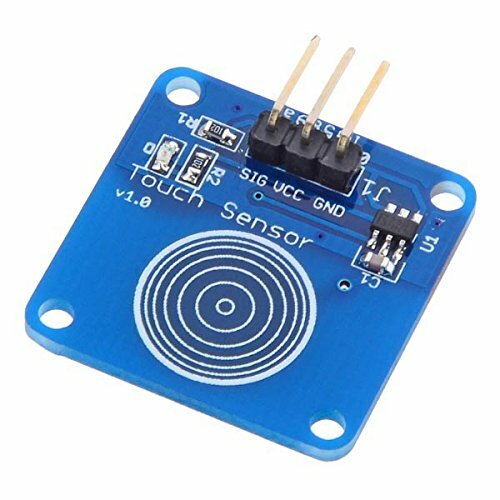 This is jog type capacitive touch switch sensor module based on a touch detection IC TTP223B. Normally, the output is low level(at mode of low power consumption). When the finger touch the corresponding location, output will be high(at quick speed mode). When the module do not be touched for 12 seconds, the mode would switch to low-power mode. It can be installed in the module, such as plastic, glass, non-metallic material surface. But not cover thin sheets(metal) on the surface of the module. Just touch the correct position, it can be hidden in walls, desktops and other parts to be buttons. Allows you to remove the troubles of conventional push-type buttons. This is jog type capacitive touch switch sensor module based on a touch detection IC TTP223B. Normally, the output is low level(at mode of low power consumption). When the finger touch the corresponding location, output will be high(at quick speed mode). When the module do not be touched for 12 seconds, the mode would switch to low-power mode. It can be installed in the module, such as plastic, glass, non-metallic material surface. But not cover thin sheets(metal) on the surface of the module.